Al Ain, UAE. 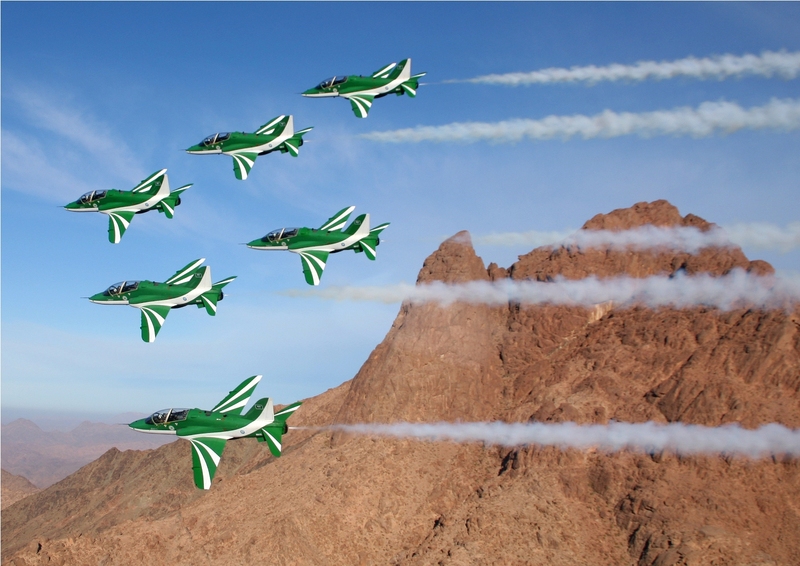 January 29, 2011: The ever-popular Royal Saudi Air Force (RSAF) Aerobatic Team – The Saudi Hawks – will soar into this year’s Al Ain Aerobatic Show with a new display boasting 23 exhilarating formations and moves, including their world record breaking largest ever aerial drawing, and climaxing with an unforgettable ‘bomb-burst’ manoeuvre. 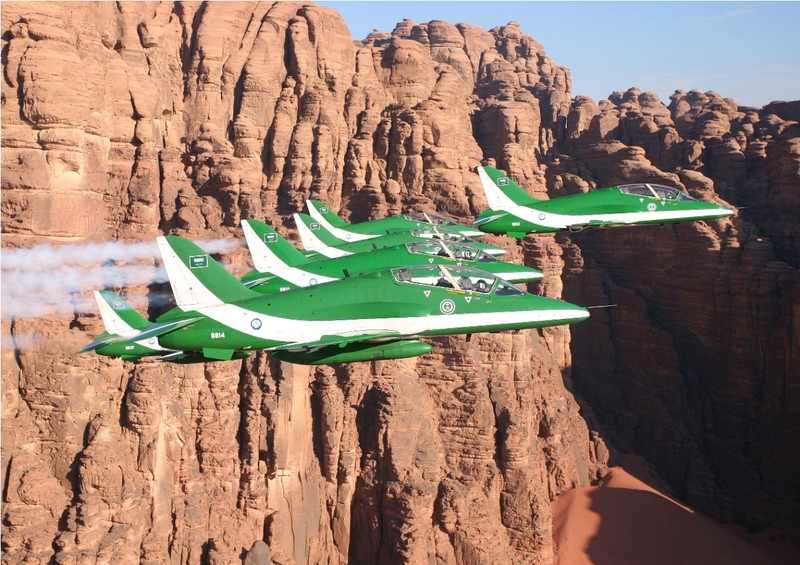 The Saudi Hawks team of six will take to their BAE Hawker 65 trainer jets to thrill an anticipated record crowd at the Al Ain International Airport with a two sectioned programme. In the display’s first half, all six jets will fly in close, precision formation, allowing the pilots to perform some of their newest routines. These will include the rainbow, the twister and the heart and arrow, as well as the ‘emblem move’, consisting of two swords crossed over a palm tree – the Saudi flag insignia - which took two years to perfect and earned the team a place in the 2010 Guinness Book of World Records for the largest ever aerial drawing. Topping off the aerial displays will be spectacular on-ground activities for the whole family, including meet-the-pilots sessions, tethered hot air balloon rides, go-karting, bungee trampolines and crazy golf, as well as face-painting and appearances by children’s favourite magazine character Majid, the Al Ain Aerobatic Show’s own Friendly Pilot Bear and a stilt-walking pilot. The 2011 Al Ain Aerobatic Show, held under the patronage of HH General Sheikh Mohammed bin Zayed Al Nahyan, Crown Prince of Abu Dhabi and Deputy Supreme Commander of the UAE Armed Forces, will take place from 2-5 February at Al Ain International Airport. Approximately 80 minutes drive from Abu Dhabi and Dubai, this easy access makes it an ideal day trip from across the Emirates. The Al Ain Aerobatic Show is backed by a high-profile sponsorship line-up that includes Gold Sponsors Abu Dhabi Islamic Bank (ADIB), Abu Dhabi National Hotels, Al Ain Water and Etisalat. Mubadala Aerospace, TDIC, Abu Dhabi Aircraft Technologies and Pilatus Aircraft are Silver Sponsors, while Emirates Motor Company are the Official Supplier and ADAC the Host Sponsor. The 2011 Al Ain Aerobatic Show is carried out in partnership with Al Ain Municipality and Al Ain Police.